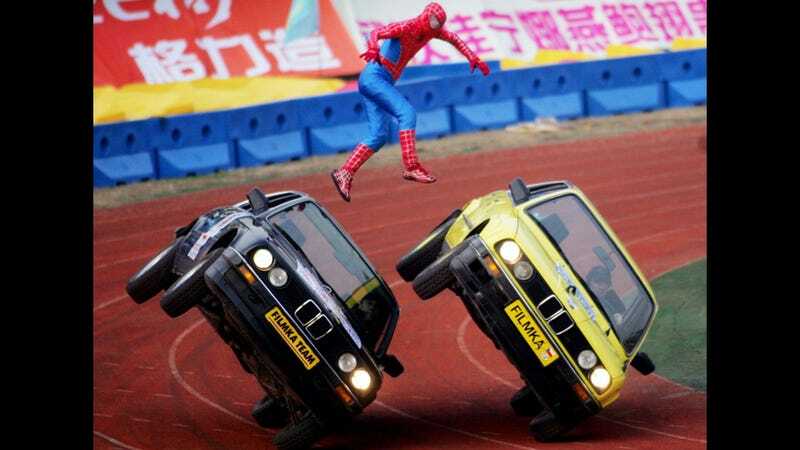 Why is Spiderman jumping between these speeding BMWs? This bizarre photo's been floating around for a while, but was recently reposted on Facebook by Arab Motors TV. What's its deal? Obviously it's not the real Spiderman, because he's in New York City. So it's just a stunt double. Makes sense. It's for a stunt show. The Spiderman bit was part of a stunt show put on by Filmka Stunts Team. They're a Hollywood-based troupe of professional movie stuntmen from the Czech Republic that formed way back in 1962 after filming the Czech western spoof, Lemonade Joe (that's Limonádový Joe). Since then, they've performed stuntwork for numerous Hollywood movies, including Indiana Jones, Titanic, Gladiator and yes, Spiderman. "Filmka Stunts Live Auto-Moto Show," is a two-hour extravaganza featuring cars and motorcycles as well as various celebrity and superhero doubles. This shot dates back to 2006, when the team performed at Xinhualu Stadium in Wuhan, China.